We all have them—uninspired times. I think there is a saying about inspiration being 10% and perspiration being 90%. I am terrible at exact quotes, but you get the message. I can be very creative in my head, but find that “the doing” isn’t always as fun, especially if my mind is focused on my do-list instead of enjoying the present moment, as I truly love to sew! My organization is a strength for me and I love to design, choose combinations of materials and cut out projects and when I am on a roll, I will prepare many projects at a time and almost prepackage them. I can function more efficiently this way as I “group” like activities. This is what I do when I am preparing for a sale. 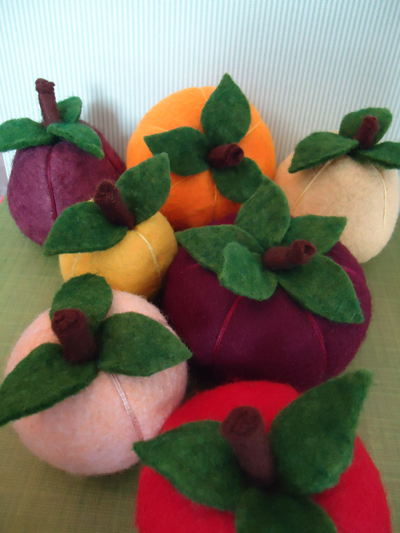 I am excited to begin sewing my projects though actually picking a place to start can be overwhelming. If I am not feeling so creative I begin with doing some tedious parts and wait to do the parts that require more creativity and design until after I have “warmed up” a bit. 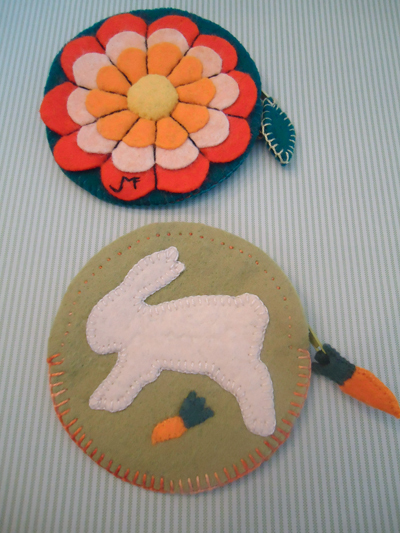 Being creative comes when I am more relaxed and enjoying the moment…like after doing some “tedious” work (as I love handwork) and get loose enough to try out a new technique. 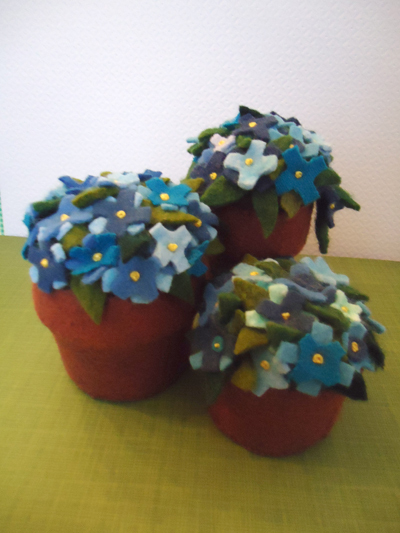 While making my flower-pot pincushions, I decide to try making some new flowers and decide to try out ruching! 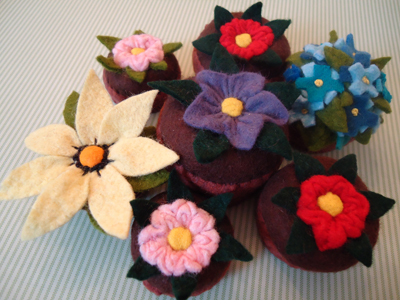 I try it with wool instead of cotton, and shape it into a flower. And then I try gathering a wool strip cut with a zig-zag edge, and suddenly I am making up my own flowers! Excitement, passion, inspiration and creativity all come together and I am doing something new! New ideas are not always successful right away, and need to be developed. I will accommodate for what didn’t go so well at first and get it better the next time. My first attempts can be rather primitive, and I remind myself that these items can be equally as loved as my more perfected projects, just ask my kids! Creativity is often born from the imperfect. So don’t trash all those beginnings that appear as disasters. 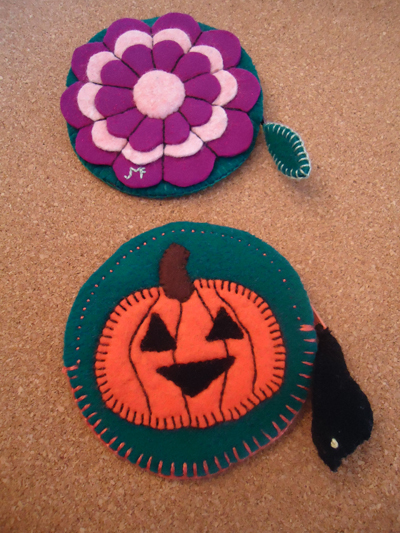 I have learned that much can be done with a “laying tool” or picking out and re-sewing a stitch or two to get them right. Inspiration and creativity seems to be a cycle. New ideas combined with risk, effort, heart and soul and a new creation is born and takes on a life of its own. It is a process. Sometimes a short nap can do much to re-energize creative zeal. Zeldie, my cat has taught me that! Other times when I am uninspired, I simply need to change my focus and work on a different project for a time. I am always surprised as to how many projects are finished by working on them only a couple of hours at a time. I continue to sew with or without inspiration almost every day, for I have learned that NOT all parts of our sewing projects are inspired and creative. Some become “work” and that is OK. When a project becomes “work” I just need to persevere. Holidays; Wonderful But Too Much!